The pool will be open for private parties on May 17 and will open to the public on May 25. This beachfront-entry, junior Olympic-sized pool offers fun and recreation for all ages. With a one-meter diving board and children’s slide, the Floresville City Pool is a hit with both avid swimmers and dog-paddling kiddos. Amenities include outdoor showers, patio furniture, shaded areas, and several snack vending machines. 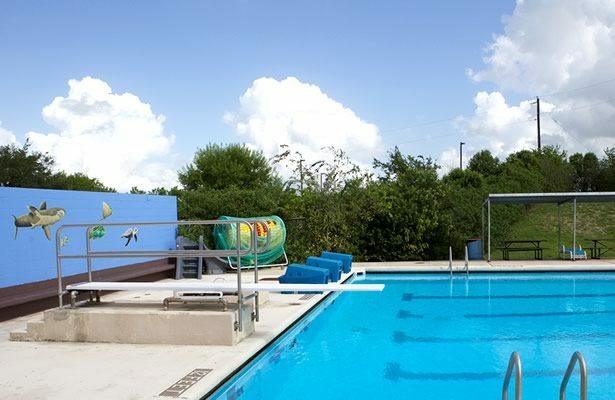 The Floresville City Pool also offers swimming lessons and classes for a nominal fee to children and adults of various ages and experience levels—from beginner to advanced. Private rentals will continue through September 8. To check for availability or reserve a date/time (May 17 through September 8), please call (830) 484-7205 and leave your name and phone number. Parties must be paid by money order only. $50 non-refundable deposit due one week from booking. Balance due two weeks prior to party date. Parties MUST be paid by money order. Cost: $50 for first child, $45 for second child, $35 for third child in family. No personal checks. Cash or money orders only. Adults (18 and older) only. No lifeguard. Adults only. No one under 18 years old through the gates. Children 12 and under MUST be accompanied and supervised by an adult 18 or older. Supervising adult should stay within arm’s reach of non-swimmers. Floaties and flotation devices should never take the place of supervision. Swimmers under 18 MUST be accompanied to deep end of pool by supervising adult, 18 or older. Infants and toddlers MUST wear swim diapers covered by a swimsuit until potty trained. ALL SWIMMERS MUST WEAR SWIMSUITS. Regulation swimwear required. Basketball shorts, sports bras, and other exercise apparel are not a substitute for regulation swimwear. A clean t-shirt may be worn over swimsuit. No alcohol, no smoking, and no glass containers allowed within pool gates. Outside food, drinks, and ice chests WILL be allowed if patron agrees to let office employees search said items. Remember your sunscreen and drink plenty of fluids. Have a fun and safe summer!